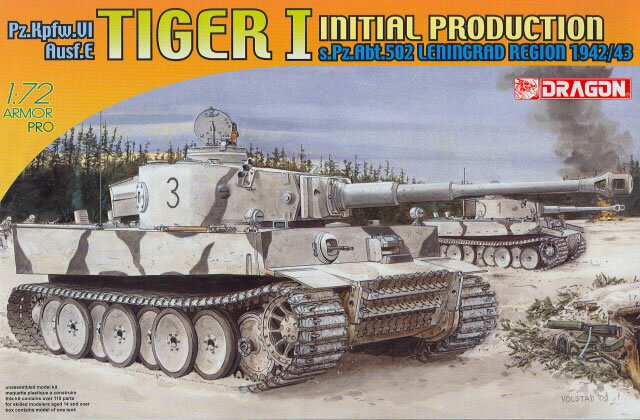 Following on last year’s Early Production Tiger I kit DML has now released another initial production variant, this time the one with the jury-rigged Pzkw. III style turret stowage bin. Other than that it is a virtual duplicate of the earlier kit but with new decals. As I noted with the earlier kit, DML borrowed the interconnected wheel sets from their popular Sd.Kfz. 251 series of halftracks and the new model has the back roads of road wheel connected by arcs that do not show once the entire four-layer set of road wheels is assembled (inner, center inside, center outside, and outer). Thus the entire 32 wheel set of road wheels per side now only requires seven parts – three linked sets and four single road wheels. The wheels are detailed on both sides even though the insides will be impossible to see. 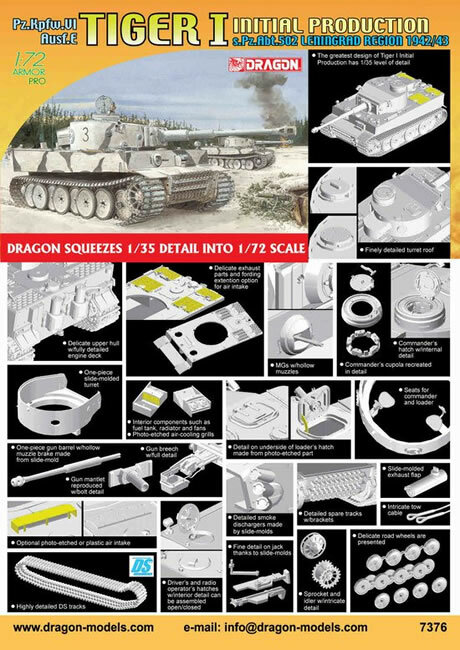 The model comes with two finishing options, both for s.Pz.Abt. 502: Mishkino, February 1943 (whitewash over gray, bort number black 3); and Tosno, September 1942 (gray overall with white bort number 132). A tiny sheet of Cartograf decals is provided. Overall this is a nice upgrade but as before now costs one-third more than the earlier versions.